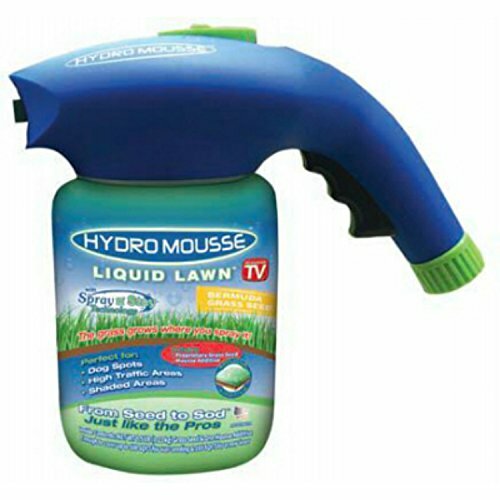 Hydro Mousse Liquid Lawn, the world's first home hydro seeding system with Spray 'n Stay technology. Contains a revolutionary patent pending system that coats, treats and blends premium quality grass with the magic mousse formula. The Hydro Mousse liquid formula contains an eco-friendly sticking solution that attaches the seed to the soil and a conditioner to loosen hard soil allowing it to absorb more water. The bermuda grass seed mixture is designed for use with long periods of scorching heat and drought. As Seen On TV Quick and easy - the grass grows where you spray it Attaches to any garden hose Great for dy spots, dog spots, high traffic areas and shade Blends perfectly with your existing lawn Eco-friendly Spray n' Stay technology attaches the seed to the soil and reduces the seeds water surface tension allowing it to absorb more water 1/2 lb seed coverage area up to 500 Sq.Ft. Includes 2 oz mousse pod 1 lb of seed. View More In Lawn Paint. If you have any questions about this product by Hydro Mousse, contact us by completing and submitting the form below. If you are looking for a specif part number, please include it with your message.